The raging drug wars have claimed nearly 40,000 lives since 2006 in a civil nightmare of beheadings, mass graves, kidnappings, and endemic corruption at the highest levels of Mexican society, as cartels rake in an astronomical $12 billion a year in illicit revenue. 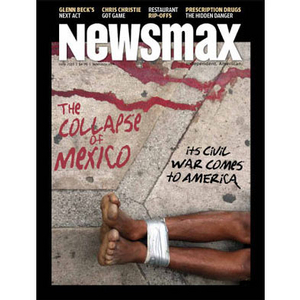 Newsmax magazine's eye-opening special report, "The Collapse of Mexico — Its Civil War Comes to America," delves into the people and politics along the treacherous border. Newsmax spent two months conducting more than 20 interviews during visits to border areas in Texas, New Mexico, and Arizona, and found that despite the administration's reassurances, Mexico's drug cartels have penetrated deep into our nation's heartland, striking fear in ordinary Americans. Frightening fact: Even the Government Accountability Office concedes that the United States can prevent or interrupt illegal entry along only 129 miles of our 1,954-mile southern border. Border fence lands U.S. residents in "Mexico"
Cartels use high-tech surveillance gear in U.S.
Border Patrol's bogus claim of "acceptable control"
Mexicans' cruel choice: "silver or lead"
Can China's rise top the U.S.? Are you holding too much cash?